It’s a fast-moving and unpredictable world where economic, political, social and technical developments impact everyone instantaneously, on a global scale. With a constant barrage of unknowns in the boardroom, how can you successfully lead your business into the future? This comprehensive, twenty-four page report "Urgent Future: New IT Forecast" provides the foresight you need to turbocharge your leadership. Topics covered in this report: Digital Strategy, Agile Transformation, User Experience, DevOps, Full Stack Development, Big Data & Data Science, Quality & Test Automation, Cloud Infrastructures, and Security. 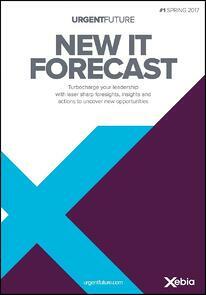 Download the FREE New IT Forecast now.